What a wonderful day it was yesterday. The sun shone and the world seemed a much brighter place. It was a little bit chillier than it has been but what a good excuse to wear my new creations!!! Yay! I finished my scarf (see the tassels!) 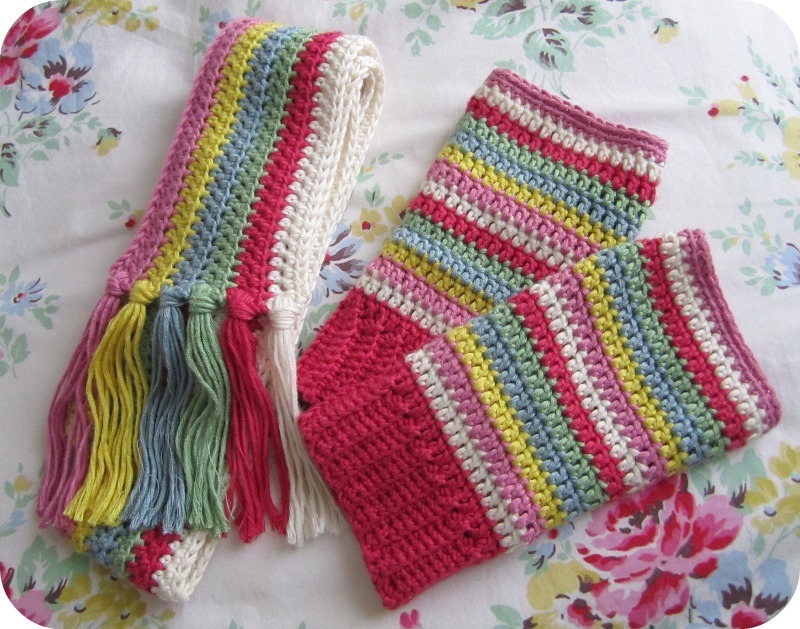 and made matching wrist warmers following Julia 'is there no end to her talents?' Crossland's brilliant toasty mitts pattern. I honestly think they are the first 'items of clothing' I have ever made myself and worn. What a lovely feeling that is. Gorgeous! Simply Gorgeous! It's a great feeling making something to wear isn't it! You are right to feel so good about making and wearing your creations, they are simply gorgeous! You are a clever Heather! Your hands look fine - I love the pink rose ring. Oh so so cute! I just love the colours, so sweet! And proud you should be,,,,stunning tassels hun! Oooh, I love the colours, just right for this time of year! Gorgeous colours, have fun wearing. I just happened upon your site! I am learning how to crochet and I love your stuff!! I'm following along. I have a whole bunches of blog's....so if you would like to visit, go to "A Lovely Thought", first. Heather, the mitts and scarf are gorgeous!!! Well Done! I love the colours! 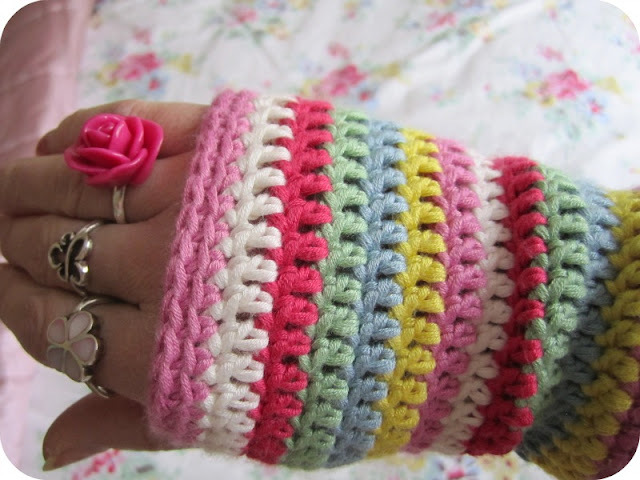 Saw those mitts on Julias website the other day, now I definitely want to make some! Love the colors! What a cheerful set to get you through winter!